Hollande supported the Saudi Arabian-led intervention in Yemen, re-supplying the Saudi military. France authorised $18 billion (€16 billion) in arms sales to Saudi Arabia in 2015. [check quotation syntax] In 2014, French bank BNP Paribas agreed to pay an $8.9 billion fine, the largest ever for violating U.S. sanctions against Iran at that time. In October 2016, Hollande said: "When the (European) Commission goes after Google or digital giants which do not pay the taxes they should in Europe, America takes offence. And yet, they quite shamelessly demand 8 billion from BNP or 5 billion from Deutsche Bank." ^ "EU must be firm on 'hard' Brexit, says Hollande". Sky News. Retrieved 4 December 2016. ^ Chrisafis, Angelique (7 October 2016). "UK must pay price for Brexit, says François Hollande". The Guardian. ISSN 0261-3077. Retrieved 4 December 2016. ^ Horobin, William (1 December 2016). 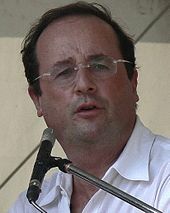 "French President François Hollande Says He Won't Run for Re-Election". Wall Street Journal. ISSN 0099-9660. Retrieved 4 December 2016. ^ "Tourism is a Top Priority for President François Hollande's Administration | US Media". us.media.france.fr. Retrieved 4 December 2016. ^ "Tourism in France takes fresh hit from recent terror attacks". France 24. 7 August 2016. Retrieved 4 December 2016. ^ "Disappointing growth, suffering tourism". Understand France. 3 August 2016. Retrieved 4 December 2016. ^ "France Economy: Facts, Population, GDP, Unemployment, Business, Trade". Heritage Foundation. Retrieved 4 December 2016. ^ "The World Factbook". Central Intelligence Agency. Retrieved 4 December 2016. 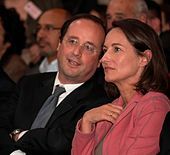 ^ "Why is François Hollande so unpopular in France?". RFI. 6 May 2013. Retrieved 4 December 2016. ^ Chrisafis, Angelique (29 October 2013). "François Hollande becomes most unpopular French president ever". The Guardian. ISSN 0261-3077. Retrieved 4 December 2016. ^ "Nearly 90 percent of the French now disapprove of their president". Washington Post. Retrieved 4 December 2016. ^ "Francois Hollande now the most unpopular president in French history". Mail Online. Retrieved 4 December 2016. ^ "French bank fined for violating US sanctions". Deutsche Welle. 20 October 2015. ^ "Ukraine decorates 'immense' ex-president Hollande". 1 October 2018.